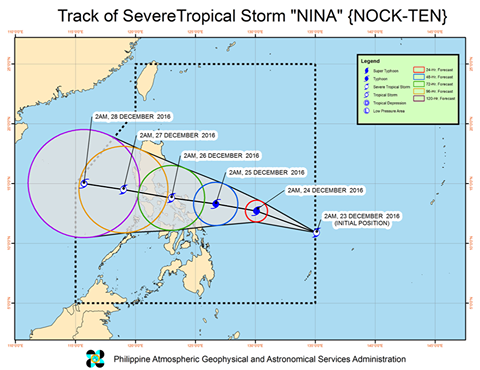 MANILA, Philippines - Severe tropical storm "Nock-ten" has entered the Philippine Area of Responsibility (PAR) and was named "Nina," weather central PAGASA announced in its 5:00 a.m. bulletin on Friday, December 23, 2016. PAGASA said the 14th storm this year has entered PAR at 3 a.m. on Friday. At 4:00 AM today, the center of 'Bagyong Nina' was estimated based on all available data at 960 km East of Guiuan, Eastern Samar(11.0°N, 134.5°E). It has maximum sustained winds of up to 95 kph near the center and gustiness of up to 120 kph. 'Nina' is forecast to move West Northwest at 25 kph. Based on the forecast track, 'Bagyong Nina' is expected to make landfall over the Bicol region on Christmas day, Sunday. The estimated rainfall amount is from moderate to heavy rains within its 350 km diameter of the severe tropical storm. Weather bureau said that cloudy skies with light to moderate rainshowers and thunderstorms will be experienced over Eastern Visayas, Caraga and Davao Region. Partly cloudy to cloudy skies with isolated rainshowers or thunderstorms will prevail over Metro Manila and the rest of the country. As of press time, no tropical cyclone warning signal has been raised by PAGASA. 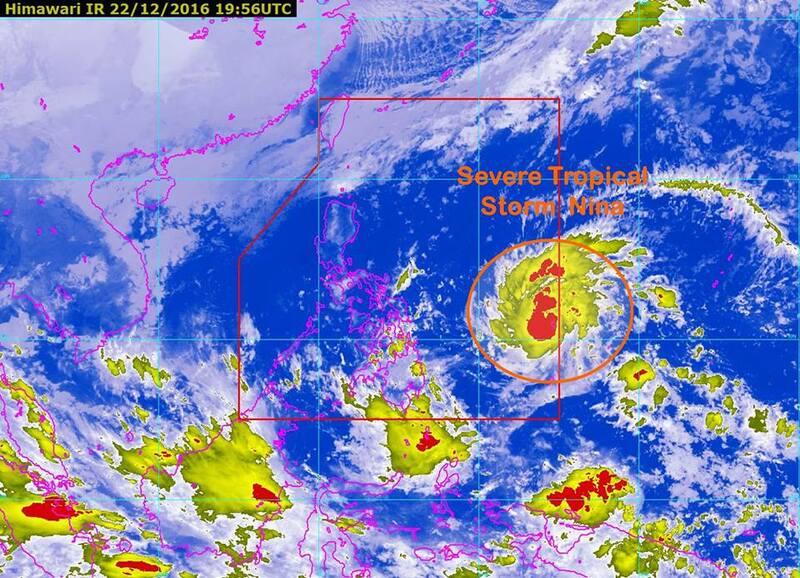 The U.S. Navy and Air Force's Joint Typhoon Warning Center (JTWC) indicated that 'Nina' may directly hit Metro Manila on Monday. It is forecast to cross Southern Luzon and its center may pass through Quezon province, Laguna and Batangas before hitting the central region.